As Week 1 comes to a close, the young dancers are digging deeply into movement material presented to them in class. Each incredible teacher at the workshop challenges students with fresh perspectives on embodied ways of learning, moving, and thinking. One of these teachers, Amy Miller, is new to the festival but a champion of the dance field. She currently works as the Associate Artistic Director and Company Director at Gibney Dance, having the opportunity to perform, choreograph, advocate, and teach. She is one of two modern teachers at our Young Dancer’s Workshop, creating a nourishing classroom environment that is accepting and welcoming of all students. Speaking often of how she is “standing on other’s shoulders,” her movement vocabulary is richly imbued with her knowledge and expertise, allowing students the foundation to stand on her shoulders as well. I had the privilege of sitting down with Amy to talk about her time at the festival, her teaching style, and all other things dance. BDF: We’re nearing the end of Week 1 of YDW. What is your sense of the festival so far? 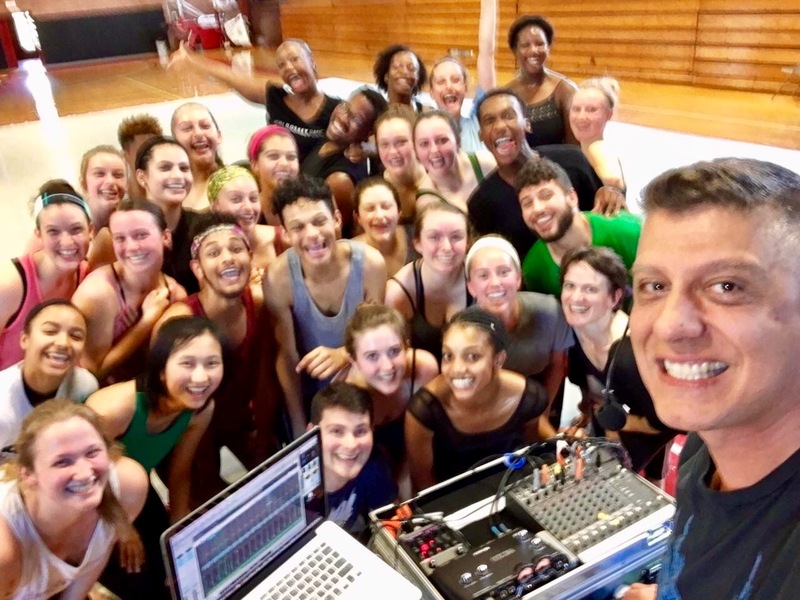 AM: I have been a part of BDF/Gibney Connect at Gibney Dance Center, so I was excited when Laura asked me to join Young Dancers Workshop and have three weeks to really see what we could discover. First off, I am amazed by how thoughtful the daily schedule is: thoughtful around space, time, breaks, food, conversation. We can really spend the time to be together and reflect, debrief about the day, and share about our lives. It seems really extravagant and lovely and necessary all at the same time. I am learning so much from taking the classes of the other faculty here; the specificity, the individual attention, the prioritizing of the human. Every teacher has all the tools to really set a rich environment for learning and connecting together. There is a beautiful balance between rigor and ease, which is so applicable both inside and outside the studio. I’m already feeling like I want to reinforce what is happening in other classes in my own class as a way to continually remind ourselves that these are not disparate movement sensibilities, but that all these ideas are connected. All the aesthetics are equally valuable, and if we can have them all in our toolbelt, we will realize how ready and available we can be. I am also so captivated by the larger discussion around how everything we do in the studio is applicable to our daily lives. I’ve never been in an environment where this idea is as explicitly stated and as organically present in what’s happening. I feel like my job being part of this festival is to gratefully hold on and ride the momentum of this culture of forward movement and connection that has been cultivated here over these many incredible years. Dance is valued as the vehicle for creating amazing citizens of the world, and in literally every experience in just the past five days, that has felt like a very intentional priority. BDF: What are some of the principles you hold in your teaching? AM: I think I am interested in loops. I’m really not interested in setting up a situation where I am the sole producer and the students are just receivers. I’m interested in a balance of information coming from me to the class and information coming from the class back to me, and with the incredible live musicians as well. There is an iterative process going on that allows me to read the room and make choices in the moment. I come in with my phrases and things I know work, but I’m constantly looking for how we can co-create an environment together with this material. I’m experimenting as I go. I’m relishing the opportunity to work with this stunning group of students so intensively; to really dive into concepts, sensations and strategies that will get more and more nuanced with time. BDF: Can you tell us about the work you do with Gibney Dance and art in NYC? AM: I’m a full-time dancer with Gibney Dance Company, and as Company Director I oversee rehearsal direction, and work closely with our Community Action team to implement our healthy relationship programming with high school students and movement workshops with survivors of intimate partner violence. We’re in the studio, we’re out in the community, we’re advocating for dance and the power of the arts. The ideals that are happening here at Bates are so akin to our values at at Gibney Dance Center. We all know that dance artists have so much to offer our world; we are entrepreneurial creators with incredible work ethics who value empathy and collaboration; amazingly versatile life skills that allow us to be successful at virtually anything we put our positive energy toward. BDF: Who would you put in your “Young Dancer, Need to Know” word bank? AM: Research who’s ideas came before us and what they were responding to in the world: Martha Graham, Doris Humphrey, Anthony Tudor, Jose Limon, Paul Taylor, Trisha Brown, Alvin Ailey, Merce Cunningham, Lucinda Childs, Katherine Dunham, Simone Forti, Steve Paxton, Fred Astaire, Ida Rolf. Research who is evolving ideas today and what they are responding to in the world: Katherine Ferrier and The Architects, Nora Chipaumire, Axis Dance Company, Kyle Abraham, Stephen Petronio, Counter Technique, The Bang Group, Anna Terese De Keersamaeker, Jonah Bokaer, Brooklyn Academy of Music, MANCC, Simon Sinek, and YOU! BDF: Are there any words of wisdom you would like to share? AM: Let us remind ourselves that we are powerful and each of us can be a leader at any moment of the day. We don’t need to wait to be picked by someone else. Invest in and rely on other people for sure, but also cultivate the ability to create opportunities for yourself. Discover a way, don’t wait for someone to say yes, say yes to yourself, keep picking yourself.